Fast Natural Permanent treatment of Alopecia is possible. Cases with recent & only one bald spot can improve within 4-8 weeks and cure in 6-9 months. Alopecia Areata (baldness in spots) is a form of hair loss, usually from the scalp, although it can affect other areas of the body. The hair loss mostly remains limited to the scalp but in certain cases it can extend to eyebrows, eyelashes, facial hair (beard, mustache), nasal hair and give rise to bald spots anywhere in the body. Alopecia Areata is a common condition which arises largely due to a mix of immunological and hormonal factors. Alopecia Areata can affect both men and women and it is not uncommon to see children affected with this disorder. Approximately 2% of the general population worldwide suffers from Alopecia Areata. Alopecia Areata is considered to be an auto-immune condition in which the immune system of the body (which protects the body from bacteria and viruses) mistakenly attacks the hair follicles and destroys them. This leads to hair loss in the affected area. The commonest presentation of Alopecia Areata is appearance of bald patches on the scalp. In most cases, hair falls out in small, round patches about the size of a small coin. The patient may have single or multiple such patches. 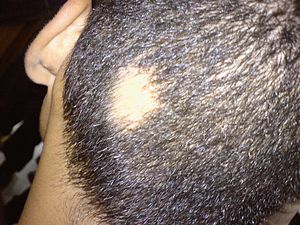 In some cases these patches may remain static, whereas in some cases the patches may spread to involve larger areas of the scalp. In some cases, hair loss is more extensive. Although it is not very common, the disease can progress to cause total loss of hair on the head (Alopecia Areata totalis) or complete loss of hair on the head, face, and rest of the body (Alopecia Areata universalis). Alopecia Areata is the body’s way of telling that something seriously wrong is going on inside and needs to be cured. Unfortunately, instead of listening to the body, most conventional treatments rely on using medicines which suppress the immune system (immune suppressants) and drive the disease deeper, making subsequent cure difficult or impossible. Alopecia Areata usually accompanies Under active Thyroid (Hypothyroidism) and Diabetes Mellitus. The treatment and prognosis is dependent on control of all of them at the same time. We use Homeopathy to offer Fast Natural Permanent treatment of Alopecia. Below are some facts about Homeopathy. Best of all extremely cheap. Homeopathic medicines (called remedies) are less than $10 for more than 5 (five) years of supply! If you want to benefit from the Fast Natural Permanent treatment of Alopecia with homeopathy, you can Contact Us for any further details or help or you can use our FREE Smart Remedy Finder to find the right remedy within minutes for many ailments & injuries along with detailed prescription guidelines on how soon to expect improvement, when to repeat the dose etc.